Every school has its irritating fans, and the Ducks are certainly no exception. Stanford has its offensive band that — due to some transgressions — got banned from traveling to away games next season. And when it comes to irritating, USC’s band and the only song it knows are hard to beat. But when it comes to top-to-bottom irritating, one school stands out. It’s not because its teams always win — which they don’t. It’s not because we know they’re smarter than we are — which they aren’t. It’s because this school has made being irritating an art form, and I don’t mean this in a nice way. 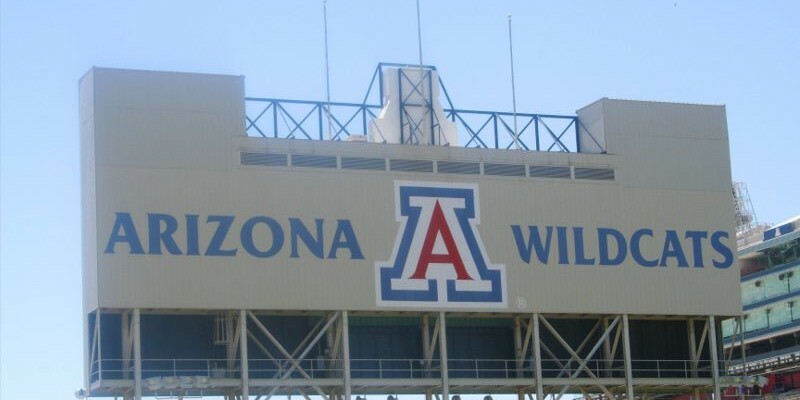 The institution, fans and even the players of the University of Arizona Wildcats are the subject of this week’s Three-and-Out. 1. The Institution. Ironically, Arizona athletic director Greg Byrne says that the Wildcats are doing everything they can to improve the quality of the Game Day experience to draw fans, according to a recent ESPN article. I can hardly stand to watch Arizona home football games even on television and will only watch when Oregon is playing and my mute button is in solid working order. Seeing one live is out of the question. No matter how many times they play it, the USC band cannot compete with Arizona. This is, of course, all because of Arizona’s third down siren. Whenever the Wildcat defense completes the monumental task of getting an opposing team to third down, the P.A. manager fires up a piercing — and by design, irritating — air raid siren. Obviously it’s meant to disrupt the opposing team. It certainly isn’t to add to the appeal of the Game Day experience. Having fans disrupt the opposition with the power of their own vocal chords is one thing. Piping in high-powered electronics to the same goal — using a trick borrowed from WW II Nazi fighter-bomber pilots — is crossing the line. 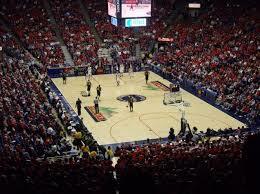 But Arizona’s institutionalized irritation is not limited to football. Even the field announcer for softball games gets into the act as he announces each Wildcat batter coming to the plate. A little home field enthusiasm is one thing. Making every batter that steps up to the plate out to be the Second Coming is going too far. Thank God for mute buttons. 2. The fans. Where to begin? Arguably the most classless acts that Arizona fans have contributed to the cause had to come at the end of the 2009 Oregon football game. With Arizona up by a touchdown and a trip to the Rose Bowl on the line, in the closing moments the fans hopped out of the stands and crowded the field, readying to celebrate. Oops, Oregon tied the game and won in double overtime. Apparently not recognizing that their antics were bad enough for a day’s work, the fans hurled garbage and filled water (?) bottles at the Oregon team and cheerleaders as they left the field, sending one cheerleader (female) to the hospital. In another antic that actually bordered on being amusing, an Arizona fan disrupted a football game against UCLA by (sort of) dressing as a referee, coming onto the field and stopping play. Not surprisingly — considering the participants — a brawl subsequently broke out between the Arizona and UCLA players. Apparently for no reason other than some Bozo dressed as a ref running onto the field blowing a whistle. [Heavy sigh.] It doesn’t take much. A solidly functioning mute button is a must for watching Arizona sports. But beyond all of that there is the everyday. And for Arizona fans, the everyday is copying the “USA … USA … USA” chant, only cleverly changing it to “U of A … U of A … U of A …” ad nauseum. It’s enough to make a guy long for the Trojan band and the one song they know. Over and over and over again. And again. Or the Stanford band doing whatever it can come up with to raise the bar for being offensive. 3. The Players. And not just any players — the softball team. The chatter and even singing from the dugouts during softball games adds a certain charm to the overall experience. And all those ponytails — what’s not to love? 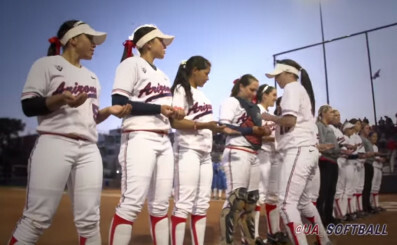 Arizona softball captain makes sure everybody remembers the words to the “Three balls” chant. Here’s a softball program — Arizona — that has multiple NCAA championships. And yet they’re acting like a bunch of third graders. Between them and the field announcer, the only way to watch an Arizona home softball game is with the sound securely in the off position. It is a common belief that Oregon has a recruiting handicap because of rainy weather and temperatures that often lean toward the cool. But it’s always possible to carry an umbrella and you can always put on more clothes. On the other end of the scale, there is a definite limit to how much clothing you can remove in an effort to avoid overheating the gray cells when in Tucson. If somebody ever wants to look into the dangers of having your brains fried by constant exposure to extreme desert heat, Tucson would be a good place to start.